This guide is to point you to resources and services at the USC Libraries that support Middle East Studies. Use the sections on the side of this guide to navigate where you need to go. 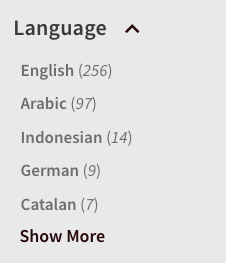 You can find foreign language books, newspapers, articles, and more by using the main USC Libraries Search on the libraries' homepage. After searching, look for the "Language" option under ways to refine your search and select the language you're interested in. If you don't see what you're looking for expand your results by clicking "More." Try both Romanized characters and script for the most effective searches. Be careful with word division rules - for example, articles are included in Arabic and Hebrew searches but prepositions use a dash in the Romanization of Hebrew. Be flexible; try other variant spellings and translations of words. If you omit hyphens, leave a space. For example, in Romanized Hebrew "ve-eleh" can also be searched as "ve eleh" to find all relevant results.